Plants for a Future's Blagdon Cross in Devon, was purchased in 1997 with the purpose of developing a Demonstration Garden and Ecovillage. A lot of activity occurred on the site but the original plans were never realised. Over the ten years they had the site it became a wildlife paradise and recovered from severe degradation. 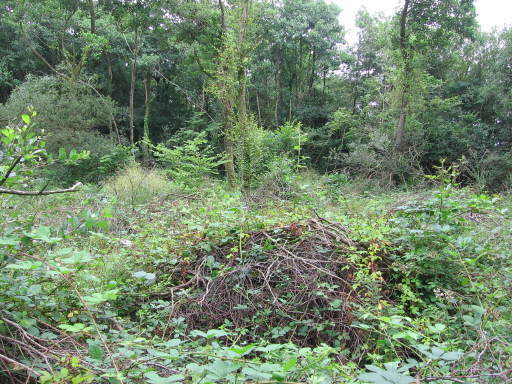 The site was 84 acres with 5 acres of mature woodland and 15 acres of newly planted woodland, 4 acres were culm grassland a rare habitat specific to Devon. 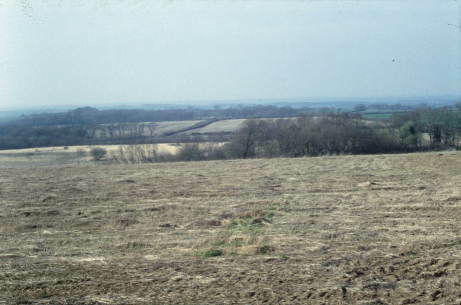 The remainder of the land has been naturally regenerating and illustrates how wildlife flourishes under low impact management without the use of animals. 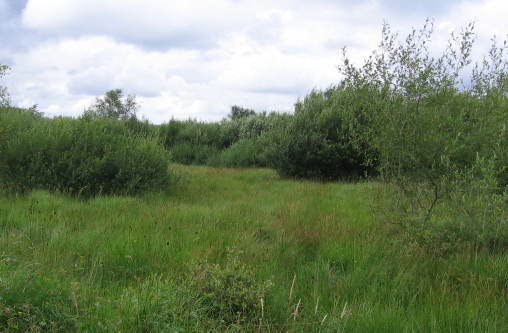 The site has now been sold as a nature reserve focussing on the rewilding. Marks Fishers posts on wilderness have been a real inspiration to me and have given me a new way of thinking about the site. 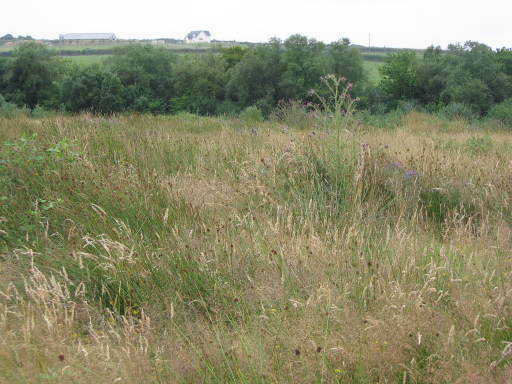 The site is 84 acres of undulating land in North Devon, we bought the land eight years ago when it was in a very poor state with many fields completely bare, even though they had been lying fallow for two years previously. Now the most site has been allowed to regenerate naturally and is a vibrant example of nature taking its own course. The pattern of regenerating is intriguing. Rather than seeing the whole site develop in the same way with the same dominant vegetation we have seen a mosaic of different habitats and plant communities emerge. 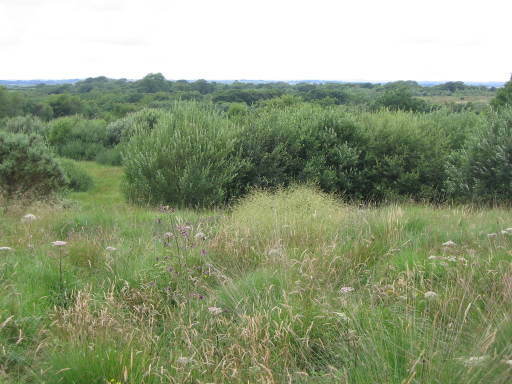 Some parts have gorse as the dominant vegetation, others are predominantly goat willow, others are bramble, and other wetter parts are heavy with reeds. Remarkable much of the site has remained as grassland with little colonization by goat willow, gorse or bramble. Goat Willows on boggy ground, orchids spotted here. 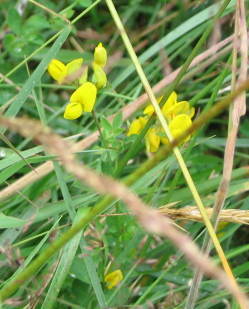 Beneath the dominant vegetation we see a rich variety of wild flowers and other plants. 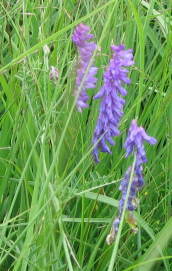 In one part over 30 species of wild flower have observed. 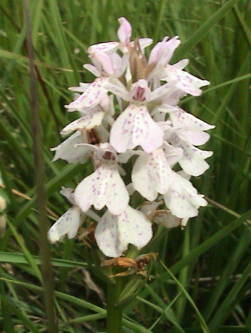 In another place there is a thriving community of orchids (Common Spotted Orchid, Dactylorhiza fuchii). Natural Grassland, uncolonized by gorse, goat willow or brable. Young oak trees have also been observed over much of the site giving a clue to how the site might develop in years to come. Eight years is only a brief period for regeneration with colonization by pioneer species (goat willow, gorse and bramble are classic pioneers). As time progresses we will observe how the regeneration progresses, as it tend towards climax vegetation where oaks and other broad leaf trees take over. 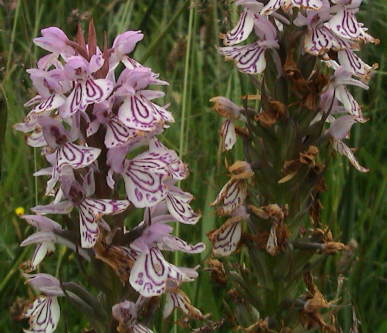 Some of our orchids, Common Spotted Orchid, Dactylorhiza fuchii. There is also a rich variety of wildlife on site. Grass snakes have been spotted near an abandoned pile of compost, and last year saw a the grassland areas full of six spot burnet moths with a distinctive red and black markings. Voles, dormice, foxes, badgers, moles and lizards have all been spotted as well as 46 different types of birds and 20 species of butterflys and moths (probably a very low estimate). Four different species of deer are common visitors to the site, a big problem to the trees we've planted but not to the wild lands. Thinking about the site as wilderness has given me a very different view to the site. Before the gorse, goat willow and bramble were all problems needing a lot of labor to manage. But now they are not problems, they keep each other in check and much grows beneath. Other invasive species such as Himalayan balsam are also present but these are contained by the mosaic of habitats. To follow the adage "A weed is only a plant where you don't want it to be" at Blagdon nothing is a weed. There are conflicts between ideas of wilderness and those of managing land for wildlife. Parts of our site are culm grassland and from a traditional wildlife perspective we should impose a traditional management regime with a mix of light grazing and cutting every four years. One can raise questions as to whether this sort of management is really sustainable as it requires constant attention. If the management stops for a period then the land will regenerate in a different pattern. True unmanaged wilderness will take care of itself and may provide a stronger habitat as we beginning to see the effects of climate change. A glade created in the woodland. Coppiced winter 2003/04. 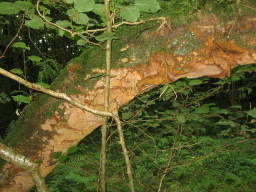 Fungus covering much of a fallen tree. 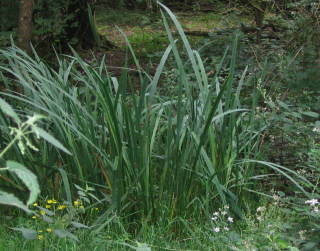 A iris in a boggy part of the woodland. 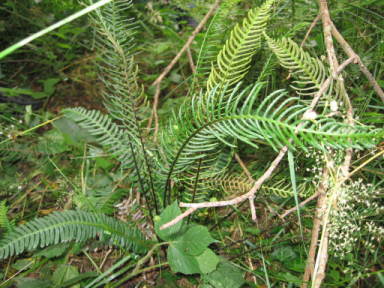 Botanical survey of the site produced in 2007. July 2014 photos from a return visit to the site. Mark Fishers writings on self-willed land and wilderness. South Beer Farm Nature Trails the current owner. You need to contact them if you wish to visit. George Monbiot’s Feral a must read book on rewilding. This article was written by me and originally published on the Plants For A Future site (C) Plants For A Future, 1996-2008. This work is licensed under a Creative Commons License. You can copy, distribute, display this works and to make derivative works but: Attribution is required, and it's Share Alike (GNUish/copyleft) i.e. has an identical license. Based on a work at http://singsurf.org/pfaf/BlagdonWilderness.php.